There are two locking eyes between the rear exterior seats for fixing the ISOFIX system child seat in place. 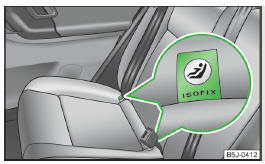 The places are marked with labels with the ISOFIX logo » Fig. 16. Always refer to the instructions from the manufacturer of the child seat when installing and removing a child seat with the ISOFIX system. Never attach other child seats, belts or objects to the attachment points eyes intended for the installation of a child seat with the ISOFIX system – risk of death. A child seat fitted with the ISOFIX system can only be mounted in a vehicle fitted with an ISOFIX system if the child seat has been approved for this type of vehicle. Further information is available from a ŠKODA Partner. Child seats with the ISOFIX system can be purchased from ŠKODA Original Accessories. Overview of the use of child seats fastened with the ISOFIX system on each of the seats in accordance with the ECE-R 16 standard. a) The size category is shown on the label attached to the child seat. b) If the front passenger seat is fitted with the ISOFIX system attachment points, it is suited for the installation of an ISOFIX child seat with the “Semi-Universal” approval. IL-SU The seat is suited for installation of an ISOFIX child seat with the “Semi- Universal” approval. The “Semi-Universal” category means that the ISOFIX child seat is approved for your vehicle. Observe the information in the list of vehicles which comes with the child seat. IUF The seat is suitable for the installation of an ISOFIX child seat with the approval “Universal” and attachment with the TOP TETHER belt. X The seat is not fitted with ISOFIX system attachment points. The anchor eyelets for attaching the belt for a child seat with the TOP TETHER system are located on the rear side of the outer rear seat backrests » Fig. 17. Always refer to the instructions from the manufacturer of the child seat when installing and removing a child seat with the TOP TETHER system. Only use child seats with the TOP TETHER system on the seats with the locking eyes. Only ever attach one belt from the child seat to a locking eye. On no account should you equip your vehicle, e.g. mount screws or other anchorage points.